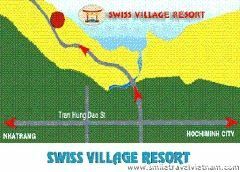 Swiss village resort, discount rates at Swiss village resort. 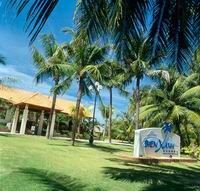 Swiss Village Resort enjoys a prime spot in the traditional village of Mui Ne, surrounded by white sand beach and blue waters. 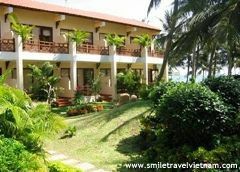 The resort has a total of 87 rooms, all set amongst coconut trees. Building roofs is a display of Imperial Palace Style curves made of traditional ceramic tiles and circular comlumns, complementing the resort area. 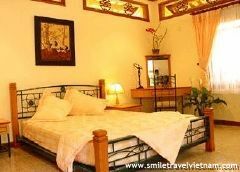 - The resort is located 200 kilometres north-east of Ho Chi Minh City, surrounded by white sand beaches and limpid turquoise water. - The airport is a long trip of 3 and a half hours of travel by car but the trip is made exciting by the beautiful scenery to the airport. - 4 villas comprises of 1 living room plus 3 bed rooms, for stay up to 6 adult + children in total of 120m2. 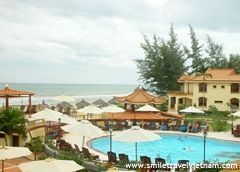 - Serving Western & Vietnamese cuisine, Fresh seafood specialties, Special dishes of Phan thiet, home cooked meals. - Conference Room for 120 persons. Fully equipped with Audio-visual, seminar equipment and secretarial services. - Outdoor Swimming pool and Whirlpool, Sailing , Windsurf and Kite surfing, Jet-skiing and more. - Excursions, Tennis court, Beach volleyball, Driving, Billiards, Petanque, 18-hole golf court at 10' drive (12km).